Chicago experienced the worst theater fire in U.S. history. The burning of the Iroquois Theater claimed the lives of over 600 patrons, a tragic number that even exceeds the estimated 250 lives lost in the Chicago Fire of 1871. Beautiful, lavishly designed and deemed “absolutely fireproof”, the ill-fated Iroquois Theater opened to the public on November 27, 1903 at 24-28 W. Randolph with the popular Mr. Bluebeard as its opening production. Just days later, on December 30, 1903 at 3:15pm, with standing room only swelling its numbers to over 2000, smoke filled the three story architectural gem. In droves, men, women and children clamored for non-existent exits through narrow, dimly lit hallways, later found to be just one fatal flaw of many. With no fire alarm box or telephone to contact help, theater-goers were left to the mercy of passers-by and sheer luck. With nowhere to turn, many leapt from balconies or were trampled in the confusion. 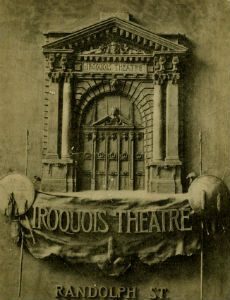 The legacy of the Iroquois Theater Fire is not in the infamy held by the number of lives it claimed, but in the lasting effect that it has had on fire regulation standards. The fiery tragedy stemmed not from one single problem, but from many factors including bribery and blatant ignorance of the fire code of the time. As a result, Chicago tightened building codes, including mandating clearly marked exits and swing-out doors for every public building in the city, setting the standard for the rest of the nation. For more on the Iroquois Theater Fire take a look at the Chicago Timeline: 1903 Iroquois Theater Fire and the Chicago Digital Collections.